SOI - international licensing system of scientific research, journals, scientific articles, patents, conference proceedings, textbooks, books, etc. DOI used to uniquely identify an object such as an electronic document. Metadata about the object is stored in association with the DOI name and this metadata may include a location, such as a URL, where the object can be found. Over 100 million DOIs have been assigned through a federation of Registration Agencies world-wide with an annual growth rate of 16%. Association of scholarly publishers that develops shared infrastructure to support more effective scholarly communications. CrossRef citation-linking network today covers over 72 million journal articles and other content items (books chapters, data, theses, technical reports) from thousands of scholarly and professional publishers around the globe. ESI is an international licensing system research, uniting in its database research and development published in scientific journals, conference proceedings, etc.. Access to data by unique code ESI assigned to each study. The KCSE was founded 2011, with a vision to improve the qualities and international status of the scientific journals published in Korea. Since then, this vision has been pursued through the concerted efforts of academic journal editors. Thanks to the full support from major scientific journals in Korea, the KCSE grew into an organization with 145 member societies and over 200 member journals, in just two and a half years. Through the activities of its six standing committees, the KCSE has provided various professional development programs to editors, authors, reviewers, and manuscript editors, which include the organization of many workshops and training programs for editors, editorial staffs and manuscript editors and workshops devoted to publication and research ethics. The KCSE has published newsletters four times a year and launched its official international journal, Science Editing, recently. These publications will provide our members valuable information on the development of scientific publishing. Fortunately, many people have expressed the opinion that our activities played positive roles in the development of Korean scientific journals. We will maintain our current programs and activities vigorously and develop new activities, which are useful to our members, in the future. With these continued efforts, the KCSE is fully prepared to play a key role in improving many domestic scientific journals to match higher international standards. Furthermore, we will actively seek out ways to contribute to the development of scientific publishing worldwide, particularly in Asia. extent necessary, the content itself. Currently active members of the Academy are more than 400 leading highly qualified specialists in various fields of natural Sciences. The main purpose of KNANS is promoting the development of science in Kazakhstan to provide for accelerated industrial-innovative development of the economy. 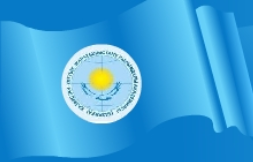 KNANS provides promising natural scientific research and technological development, develops research and innovation activities through professional consolidation of scientists of Kazakhstan, in cooperation with scientific and educational institutions, industrial enterprises, state institutions, business structures, international organizations. Currently KNANS actively cooperates with various universities of foreign countries, including the Russian Academy of natural Sciences and the National Academy of Sciences of Ukraine. Eurasian Citation Reports offers a systematic, objective means to critically evaluate the world's leading journals, with quantifiable, statistical information based on citation data. By compiling articles' cited references, ECR helps to measure research influence and impact at the journal, and shows the relationship between citing and cited journals.